What is Esri Roads and Highways? Esri Roads and Highways is a linear referencing system (LRS) solution for departments of transportation that extends the ArcGIS platform. The capabilities the Roads and Highways LRS platform supports include the following. Highway agencies manage and maintain a broad spectrum of linear referencing data about their roadways. Often, this information is distributed throughout the agency in multiple, disparate systems. These systems may not even reference the data to a common linear referencing method (LRM). For example, the public safety department might maintain crash data based on mileposts located along the highway, while the maintenance department may locate sign and pavement assets based on a distance from a known point of origin. With Esri Roads and Highways, the measures associated with data in these external systems can be kept current and synchronized with the edits made to the LRS. In addition, Roads and Highways supports multiple linear referencing methods, enabling data interoperability and sharing across business units. A common challenge in a GIS-based enterprise LRS is that business systems become unsynchronized with the GIS, because the business unit must continue adding records to its databases even when the GIS is not up to date. Roads and Highways provides a mechanism for communicating updates to the LRS so business units can continue working without waiting for the GIS to clear its edit queue. The redline is a markup feature in the geodatabase that stores information about changes in the LRS. It contains measure values, so it can be used as a substitute route feature until the actual LRS Network has been updated in the GIS. When you become aware of an error, omission, or planned change in the LRS, you can create a redline feature that GIS editors use to update the LRS. Visualize and maintain your roadway LRS Networks and associated event data. Edit and maintain LRS Networks. Provide rule-based location management, which allows you to define how event measures and route associations should react to changes in the LRS, keeping your event data aligned with roadway LRS Network changes. Roads and Highways supports updating event measures and route associations based on changes to the LRS Network. For events modeled in the geodatabase and registered with Roads and Highways, event measures and route associations can be updated directly.Roads and Highways provides a REST service for event systems modeled outside the geodatabase to acquire measure updates. Stay Put—The x,y location of the event is preserved, but the m-values may change. Move—The m-values are preserved, but the x,y location is subject to change. Retire—Both the m- and x,y values are preserved, but the event record will not display unless the event layer is rolled back to a state before the event's retire date. Snap—The location along the route is preserved, but in retired portions of a route, the event may change ownership to a concurrent route in that location; m and x,y values and route references are subject to change. 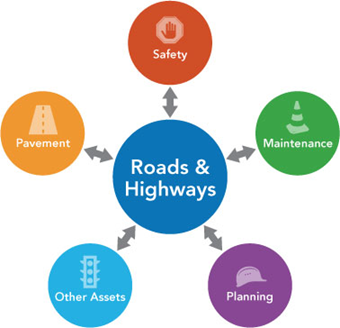 Roads and Highways is a multi-LRM LRS. The network model supports mashing up event data from different linear referencing methods. It also supports translating event data from one linear referencing method to another. Publish LRS Networks and associated event layers as map services using Roads and Highways for Server, an extension to ArcGIS Server. With Roads and Highways for Server, networks and event map services support not only visualization, attribute query, and spatial query from REST endpoints, but they also support the Linear Referencing capability that provides REST endpoints to do event editing and translate coordinates to measures, measures to coordinates, and measures between LRMs. Perform roadway characteristics editing utilizing any HTML5-enabled web browser. This allows organizations to extend the reach of their workflows across the enterprise to include users and groups without prior GIS software and application accessibility. These groups can create and edit event data from a map-centric experience from within a web browser. Roads and Highways spatially enables event data from non-GIS systems and integrates it through the LRS. Roads and Highways, in concert with the ArcGIS platform, can be used to generate a variety of reports as well as produce data products and maps that support safety analysis, traffic congestion analysis, infrastructure maintenance planning, and so on. These reports and data products can provide government and public entities transparency into many facets of highway-based data, such as highway assets, incidents, and roadway characteristics. 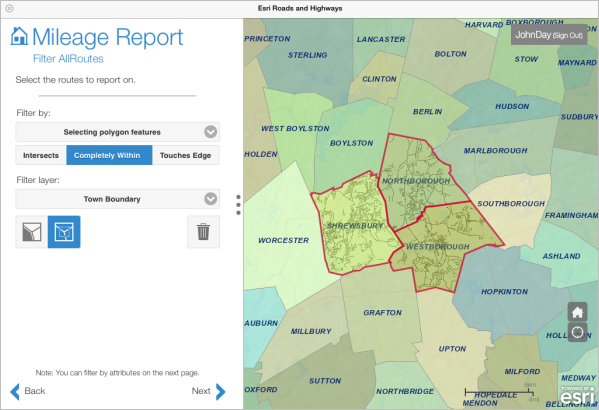 Produce mileage and segment reports using Roadway Reporter, a map-centric web application powered by Roads and Highways for Server. Roadway Reporter allows you to report the mile count of select attributes based on a summary field or a set of summary fields, or dynamically segment multiple linear event layers to produce a tabular report that consolidates the event data into one record set. Roads and Highways provides quality control checks for LRS networks and event data. In addition, Roads and Highways for Desktop includes ArcGIS Data Reviewer for Desktop, a feature set that extends the ArcGIS platform for checking data and managing data errors. For more information on ArcGIS Data Reviewer for Desktop, see What is Data Reviewer? Roads and Highways for Desktop includes ArcGIS Workflow Manager, which can be used to orchestrate data management in the GIS and across business units to develop a standard, repeatable process for LRS data management within your organization.